The Golden Bear is synonymous with golfing great Jack Nicklaus but the winner of 18 Majors has now leant his name to a new line of soft drinks. AriZona wanted to produce a new product line with a partner that shared the company’s strong sense of family values and loyal roots, and Nicklaus was the ideal fit. Nicklaus has not only been anointed the greatest golfer in the history of the sport, but as a husband of 51 years, a father of five and grandfather to 22, he has been lauded for his commitment to family. “Family has always been number one, and that’s how we run this business – that’s how I see this company,” said AriZona Chairman Don Vultaggio. The Golden Bear line features three flavours, including regular Lemonade with Honey and Ginseng, Mango Lemonade and Strawberry Lemonade. Each can features portraits of Nicklaus and his family during memorable personal and athletic achievements and are sure to become collectables. 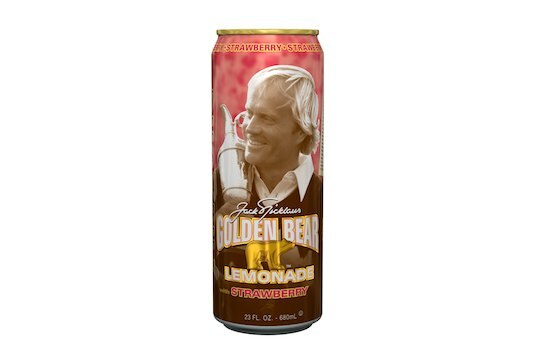 Included on each can are images of Nicklaus clutching the Claret Jug after his 1978 British Open Victory; the Golden Bear carrying son Gary off the green during his win at the 1973 PGA Championship, where he set the mark for major championship victories; and even a teenaged Nicklaus during his all-star days playing basketball for Upper Arlington High School — ironically known as the Golden Bears. Distribution of the line began in New York in late March 2012 and will continue to roll out nationally in the US thereafter.